Gary Gorton’s work describing the Global Financial Crisis as a “Run on Repo” became highly influential with people like Bernanke recommending it highly. While reading Daniela Gabor’s recent paper “The (impossible) repo trinity: the political economy of repo markets”, I noted some references that she made to work done by the CGFS (Committee on the Global Financial System) of BIS (Bank for International Settlements) on the LTCM crisis of 1998. The BIS is often described as the central bankers’ central bank and it is surprising that the leading central banks in the world had to be relearn this CGFS analysis a decade later. Shanghai to Hangzhou: Does G20 run monetary policy? After the G20 Summit in Shanghai in February 2016, there was a widespread belief that the G20 secretly instituted a “Plaza Accord” agreement to stem the rise of the U.S. dollar primarily by using monetary policy. We do not know whether there was such an accord or not, but we do know that post Shanghai, the ECB and the BOJ signalled a reduction in monetary easing and the US took a break from monetary tightening causing the Trade Weighted Dollar to drop by over 5%. A Google search for “G20 Shanghai Plaza Accord” returns nearly 10,000 results. The aftermath of the G20 summit in Hangzhou earlier this month adds to the suspicion that monetary coordination happens at G20 summits. The markets now fear that we are on the verge of a coordinated tightening – the ECB disappointed expectations on continuation of QE, the BOJ started having doubts about negative interest rates, and the US Fed is sounding more hawkish than it has in recent months. We are still at the coincidence stage of this progression and it will take another G20 summit for us to start wondering whether the omnipotent “independent” central banks are just pawns in the hands of the G20 leaders. 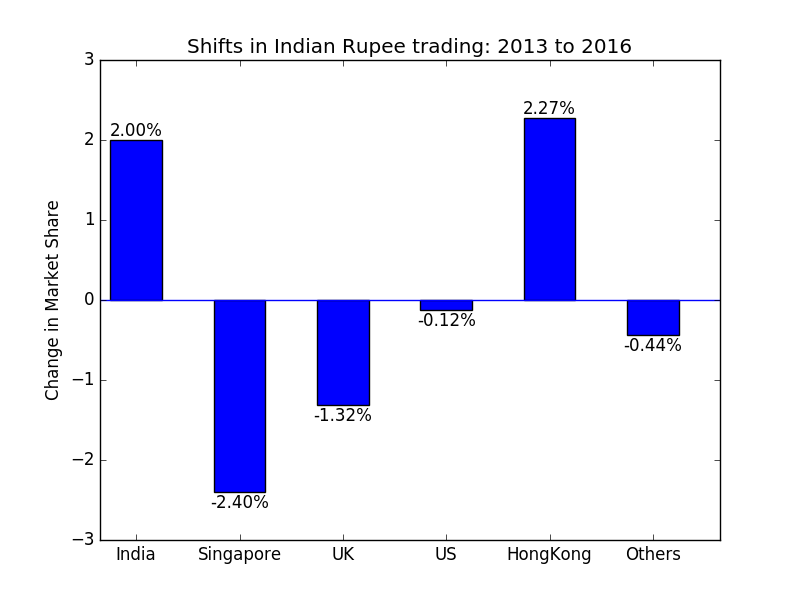 The data from the Triennial Central Bank Survey of Foreign Exchange Markets in 2016 published by the Bank for International Settlements shows some interesting shifts in the geographic share of trading in the rupee. The plot shows that India and Hong Kong have gained market share at the expense of Singapore and London. Across all currencies, Hong Kong has grown much faster than Singapore and so some shift in rupee market share in that direction is understandable, but the scale of the shift is a little surprising. More puzzling is the the gain in Indian share of trading at a time when the exchange traded rupee futures market is shifting out of India (to Dubai). The last survey was in April 2013 and the taper tantrum began only in May and so it is hard to argue that the larger share of offshore trading at that time was due to greater market stress. Posting was light in last two months. The following post appeared on the sister blog (on Computing). Brexit makes UK more European. UK government bonds have joined Europe’s negative interest rate club.